Home Goodology® Podcast Just Decide! Make a Decision! Is This Deep Enough? Obviously, the message of The Goodology Podcast is positive influence. I want to inspire people. I want to increase the supply of good things in the world. With that it gives people tools to make their lives better. It also offers an awareness that it’s possible. That is what I want to be. That is what I want to do. So, the question arises from that, ‘why’? Were you dropped on your head? Did something bad happen? Well… maybe quite a bit of both… that is another episode. Honestly, to inspire someone I felt I had to increase my own personal power. So, I was heavily into studying personal development material. Long story short, I didn’t feel I was getting the impact from that which I read in those books. The material didn’t always work or help. In doing good, and providing positive influence, I wanted to be responsible – and not just parrot back information. I wanted depth and truth. Thus, I developed my own for of personal growth called Goodology – and it’s all essentially channeled through me – and is a breakdown of our inner energetic patterns. Somewhere you may expect me to say, “that’s when I fell on my head.” Or, “that’s when I was visited by an Angel.” Or, “that is when I had my out of body experience” or “near death experience.” No, I just cared. You can blow up the feeling of anger and resentment. You can let your life be driven by it. Or you can blow of the feeling of caring. And you can use that energy of caring to drive you. There’s quite a difference. I chose the latter and dug and deeply as I could. Most certainly, I have uncovered material and energy that you don’t read about in books. Talking about Goodology is a challenge to do because it’s discussing immeasurable power that is in you – that is you and opening up to your immeasurable power. In Goodology, I call that energy a currency and I think it’s the greatest currency. The problem is that we are disconnected from it. We have built our lives around that disconnection. There is only one person that resists it and it’s you. It’s not your father, your mother, your uncle Phil, TV or anything else. There is one person that controls the ship. There is one person that drives the bus. It’s you! But, we need to think and evaluate on our own – and not just take in information willy nilly. This morning, I heard someone make a statement on a podcast – and I have a lot of pet peeves. This is one. He said, “all you have to do is make a decision!” Think about that for a second – decide. Okay so… with that, I want people to ‘have what they want,’ and to have better lives. But, I want them to have potent information and tools. Just Decide! You’ve heard it before. But is it deep enough? I am going to share a couple of example. There was a Will Smith interview that I watched a long time ago where he said, “just decide.” This is actually a good interview with a lot of good material. I listened to a podcast this morning where the guy said you have got to, make a decision. How many times have you heard that? If you want to control your destiny, you have got to make a decision. Dude, if it was only that easy. The message of Goodology personal growth is unique – it deals with inner energy – finding areas within yourself that. Another Podcast Example – and a Good Effort! I also heard another inspired individual in Texas, bless his heart speak on the same topic. He and even broke down the word. You have to decide. From the latin CIS means CUT like an incision, cutting off all possibilities except for one… So, the latin root means, literally, to cut off from. When you decide, you cut off from all other possibilities. You sound smart… You sound like you are making a good point. You are appealing to intellect. People listen and go ahh, ooh, ahh.. wow.. yeah.. that is what it means.. then they are back to living their normal lives. There is something more powerful driving the bus, and/or steering the ship. We are driven by something else. We are driven by a force that is totally overlooked – this is what we discuss in Goodology – your inner energy. Think about A DECISION again. A Decision is also a judgment, like one formally pronounced by a court. Like a SENTENCE – do you want to be sentenced? I would rather open up to so many possibilities. Obviously ‘deciding’ is very important in many, many circumstances. But it’s not the end all as many people would say. It’s not the magic bullet that in an instant changes your life. These are the types of things I want you to challenge. Think more deeply. The phrase “Just decide” presupposes some things – that everyone is working with the same amount of available inner power. That is just not true. I mean if it was that easy, wouldn’t everyone be making decisions and starring in a feature film, at their ideal body weight or making millions? There is more to the story. The inner energetic patterns that make people who they are. Seriously. Hold it. Really? Just decide? Is that enough? Just Decide is to select a course of action. Oooh, that sounds good. It sounds like you are taking control, taking charge. I am deciding. I am in charge! But things settle back to where you were. What is really in charge? It’s your greatest fear, which is your view and connection with your inner energy. That too, sounds good on paper. But, you really have to get deep into the nuts and bolts. Check out Goodology and adjust your automatic. In truth, things happen automatically in your life. When you adjust the inner mechanics, it changes the outer automatic. Some of the interviews show how people have overcome pain – inspiration and possibilities. 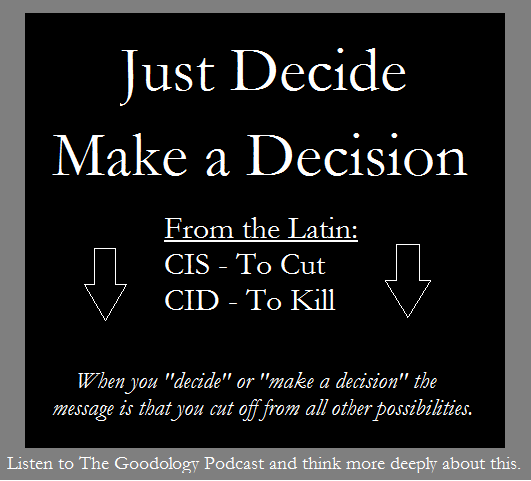 The “Just Decide” message is a simple illustration. The point is to challenge the stuff you see. Read Goodology.